In a Nutshell: Businesses in the financial services industry — among the many sectors undergoing rapid changes due to technological innovations — are trying to keep up with the best ways to engage and train employees. 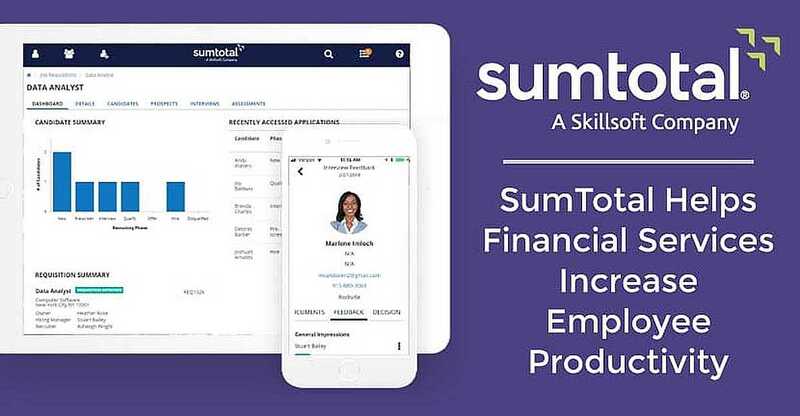 Enter SumTotal Systems, a Skillsoft company, with core HR software components, including talent acquisition and talent management, learning management, and workforce management, that provide employers with a comprehensive solution to maintaining a workforce. The company brings employee engagement into the digital age through gamification and personalization, and SumTotal makes it easy for employers to measure the success of its services and the success of employees. These days, you can be highly engaged in keeping up with your finances and rarely, if ever, have to step foot in a bank. Rapid changes in the finance industry have made it easier than ever to manage traditional bank interactions from mobile devices. Yet, plenty of brick-and-mortar bank locations with bank tellers at the ready can be found across the U.S.
And that’s where SumTotal, which was acquired by Skillsoft in 2014, comes into the picture. SumTotal Solutions’ suites consist of Talent Acquisition, Learning Management, Talent Management, and Workforce Management. The pace of innovation taking place in the world of financial services, in general, has made it difficult for many companies to keep up with the most efficient and productive ways to stay on top of employee engagement, Nelson said. As part of Skillsoft, a global leader in corporate learning, SumTotal offers products that address these issues in the financial services industry and beyond, with its HR software reaching companies of all shapes and sizes. The company currently works with three of the top five largest banks in North America, among many other financial services clients. Debasis Dutta, Vice President and General Manager of Products at SumTotal, agreed with Nelson and said SumTotal’s human capital management (HCM) solution provides the tools necessary for a company to successfully engage its employees throughout the entire employee life cycle. SumTotal achieves its comprehensive approach through four HR Suites. The SumTotal Talent Acquisition Solution provides the tools to find the right candidate and ensure his or her productivity before day one. This includes an engaging candidate experience and modern onboarding process that can be geared toward millennials, who will make up the majority of the workforce by 2025, Dutta said. This engaging, informative, and personal onboarding experience helps increase employee retention during the first year of employment, which is when most companies see the highest rate of turnover, he said. SumTotal’s Learning Management solution moves past traditional learning management systems that no longer work as one-size-fits-all training solutions, Dutta said. The SumTotal product connects skills to competencies and is delivered in the context of the employees’ goals and work. 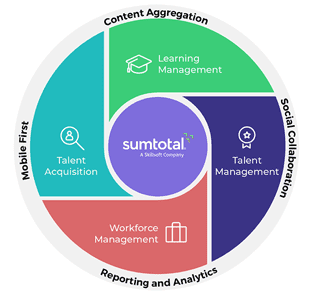 SumTotal makes it easy for people to search, discover, and be served the precise learning they need to resolve skills gaps, boost performance, create talent agility, and cultivate leaders, according to the SumTotal website. “We let the employees know what they need to do regarding training, where they can improve if there are additional skills they might need, and how they can acquire those skills,” Dutta said. The Talent Management solution helps to empower employees by allowing them to pursue their own self-directed path for development and career growth, according to SumTotal. At the same time, the programs ensure the employee’s efforts are aligned with team and company goals. SumTotal’s Performance Management enables employees to reach their full potential by capturing real-time feedback, in the 1:1 Journal, and the substance and content of career conversations, and eventually tie them back to their goals and performance review. Identifying and nurturing talent and creating talent pools at all levels in the organization is how SumTotal’s Succession Planning capabilities help eliminate organizational risk and support internal career mobility, Dutta said. SumTotal’s Compensation Management solution makes it easy for companies to create competitive compensation packages, automate workflows, manage complex global compensation policies, and build standard or custom compensation plans ensuring that organizations make informed compensation decisions. “We’re really delivering new ways to engage employees with innovations that develop, grow, and enrich the workforce,” Dutta said. Traditionally, managing timekeeping, attendance, and scheduling have required valuable company time and resources, but SumTotal’s Workforce Management solution automates these processes and can optimize productivity, according to the company. Workforce Management can also help companies maintain compliance, minimize risk, and avoid fines and litigation by ensuring employees are up to date with the most current required certifications for their positions. Nelson said SumTotal incorporates badges and gamification into its training materials. He said gamification is a recent trend that’s talked about a lot, but adding a competitive edge to employee development works particularly well for the financial services industry. He said little things like gamifying training or awarding badges may not seem like a big deal but it appeals to traits inherent to many employees within financial services. It transitions training from a mandatory task into something that becomes fun, and employees can brag about their achievements, share them on social media, and be inspired to accomplish more, he said. SumTotal Solutions provides comprehensive HR solutions that work throughout the entire employee life cycle. Dutta said SumTotal’s extremely personalized approach also makes things more engaging for employees. Dutta said it’s extremely important to engage the millennial workforce because reports show more than half are either actively or passively disengaged at work. Through SumTotal personalized experiences, employees become more engaged and more productive, he said. Dutta said that with all the available features and discussions of things like employee retention, career pathing, and onboarding, it can be easy for companies to forget this is all in service of a better business outcome. SumTotal’s system delivers robust analytics and reporting tools, Dutta said. The software tracks employees and identifies training needs, and provides managers and leaders with an easily accessible interface to quickly access important training and management data. Investment firm Edward Jones shared some of its measurable results with SumTotal, since bringing SumTotal’s HR solutions on board. “Since SumTotal’s Learning Management System has been implemented, we have seen turnover in branch assistants decline to our lowest rates ever,” Ken Dude, HR Principal for Edward Jones, told the company. SumTotal not only developed a new training catalog of online courses for the financial services company as a whole, but it also transformed its branch assistant training from 80 hours of on-screen reading into an interactive series of courses. “We believe having a training resource that is interactive and allows them to complete various phases of the training in segments has helped decrease that turnover,” Dude said. Since partnering with SumTotal, Edward Jones has delivered 700,000 training classes to more than 30,000 associates; increased on-time completion for required training from 72% to 90%; and saved more than $1 million in training-related travel costs. “With the pace of innovation that’s happening in financial services, it’s really tough for organizations to put a bunch of employees on a plane and send them to a conference for three days, and make that experience effective, when you already have an effective training platform like SumTotal at your disposal,” Nelson said. SumTotal recognizes the changing landscape in how employees engage with their companies, and it continues to offer solutions to help those companies maintain engagement. Just as brick-and-mortar bank customers are turning more and more to their smartphones to manage their finances, so are employees. SumTotal prioritizes a quality mobile experience with an app available on iOS, Android, and Windows for that reason. The company maintains a mobile-first philosophy throughout all of its products, Dutta said, so employees and managers can get the information they need wherever they may be. Dutta said SumTotal’s solutions are optimized for flexibility and provides choice to the customer. He said that the individual suites work together seamlessly to provide a comprehensive end-to-end HCM solution or can be deployed individually as the best of breed solution, depending on the needs of the company. And there are many configurable options within each of its individual solutions to tailor the experience further.